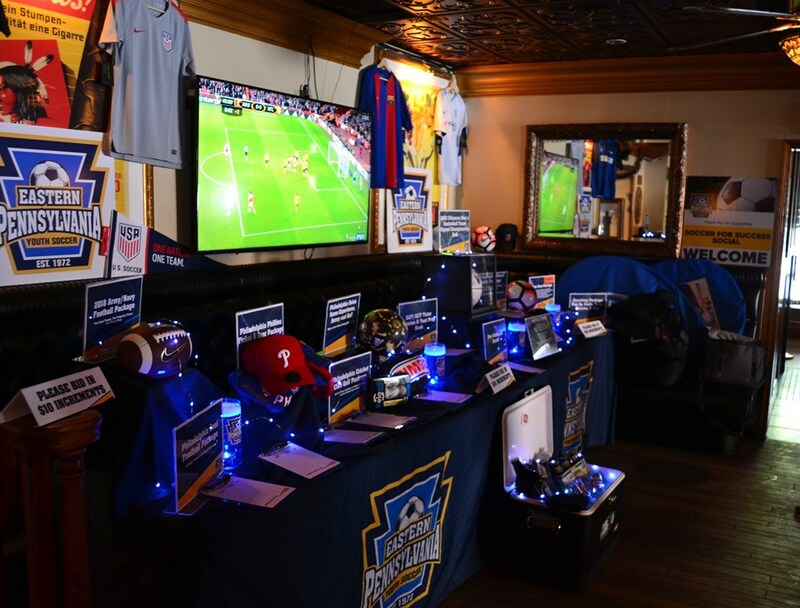 Eastern Pennsylvania Youth Soccer hosted the 2018 Soccer for Success Social Thursday, April 26 at the Great American Pub in Conshohocken. The night included a silent auction and raffle, with all proceeds going to benefit the JT Dorsey Foundation, Chester Upland Youth Soccer and the Unity Youth League of Philadelphia. All three organizations use the Soccer for Success platform to bring soccer and healthy lifestyles to underserved youth. Among the most popular auction items were a "Man Cave Package," a suite to a Philadelphia Union game, baseline seats to the Phillies and a Villanova basketball signed by the 2018 national champions. That ball went for $650. Click the image below for a photo gallery! From left to right, Jim Hardy (President, Kensington Soccer Club), Brent Jacquette (Executive Director, Chester Upland Youth Soccer), JT Dorsey (Executive Director, JT Dorsey Foundation), Gary Stephenson (Director of Soccer Development & Performance, Eastern Pennsylvania Youth Soccer), Chris Branscome (CEO, Eastern Pennsylvania Youth Soccer), Bill Salvatore (Unity Cup Director, Philadelphia Parks & Recreation) and Jim Kuntz (President, Eastern Pennsylvania Youth Soccer) celebrate the 2018 Soccer for Success Social.